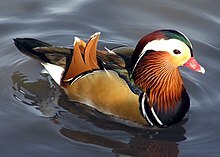 Females of most dabbling ducks[ត្រូវការអំណះអំណាង] make the classic "quack" sound, but despite widespread misconceptions, most species of duck do not "quack". In general, ducks make a wide range of calls, ranging from whistles, cooing, yodels and grunts. For example, the scaup – which are diving ducks – make a noise like "scaup" (hence their name). Calls may be loud displaying calls or quieter contact calls.